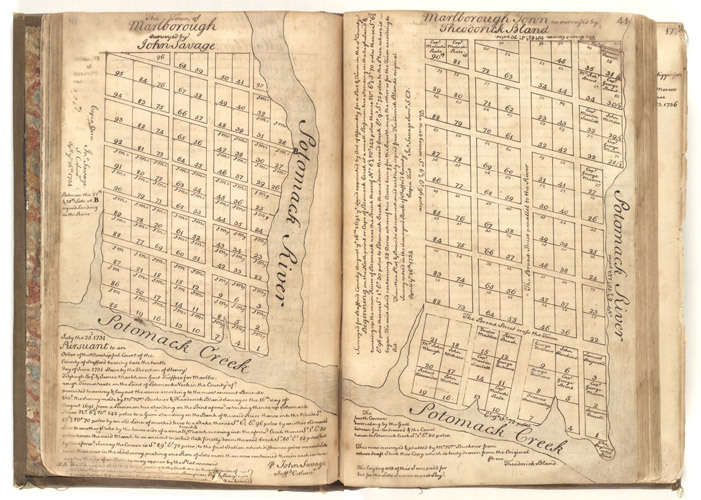 Poring over documents related to Edward Maddox, presumed father of Cornelius Maddox, I stumbled upon a circa-1691 survey map of Marlborough Town, which lay on a spit of land surrounded by the Potomac River, Potomac Creek and Accokeek Creek in Stafford County, Virginia. It was intended by the aristocratic colonist William Fitzhugh to be a major port town for Virginia, but the local tobacco planters saw the plan as a British government effort to centralize trade and enforce taxation. Its original developers, including Doctor Edward Maddox and the rest of his fellow Stafford justices, managed to initiate the plans and start building on the site, but the initiative faded after just a few years. “Doctor Maddox” can be read in plot #15 of Bland’s 1691 survey of Marlborough Town, on the right page. 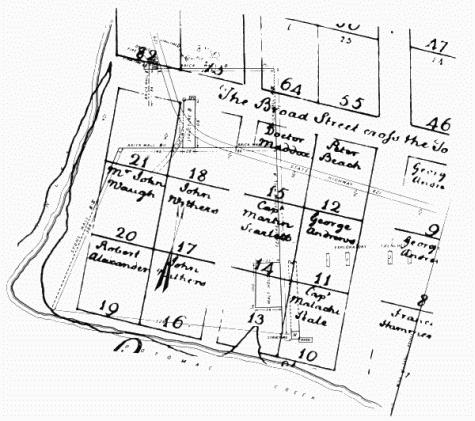 “Doctor Maddox” is clearly written within the confines of plot #15 on the survey map, which was drawn up by Bland in 1691 and copied in a ledger by the Marlborough Town revivalist John Mercer in the 1730s. We already knew from John Mercer’s “Land Book” that Edward had owned the plot, and had sold it to his friend (and rabid anti-Papist) John Waugh after a short time. But I was surprised to see the doctor’s name written so clearly on such an old map – one of the earliest surviving surveys of the Virginia colony. An archeological survey of the Marlborough Town site reveals plot #15’s exact location, with modern-day Virginia Highway 621 underlaid. This was the year after Cornelius arrived in Port Tobacco. Now we need to go to Richmond and look for other Stafford County records to see if there is any other evidence linking Edward to Cornelius.